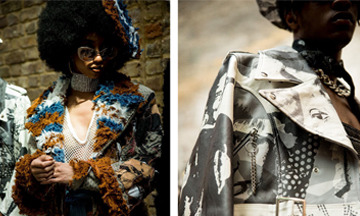 International fashion showcase, Fashion Scout London, has unveiled London-based brand Tolu Coker as the winner of its AW19 Merit Award. Created in 2009, the new talent initiative is worth £20,000 across three seasons and has been created to support and develop new designer businesses on a global level. In winning this season’s Merit Award, Tolu will receive a fully sponsored catwalk show with Fashion Scout during London Fashion Week with space to host press and buyers. The Merit Award provides a unique platform for the brightest new designers, with many going on to become established labels within the international fashion industry. Tolu Coker follows in the successful footsteps of past winners including; Eudon Choi, Phoebe English, David Koma, Roberts|Wood, Han Wen, Xiao Li, Katie Ann McGuigan, EDDA and SS19 winner i-am-chen. Tolu Coker is a unisex fashion brand centred around inclusivity, diversity and social responsibility. The brand explores and acknowledges hybridity and fluidity in societies and cultures, translating this into forward-thinking fashion and environmentally conscious clothing, shoes and accessories. Tolu aims to showcase her identity throughout her work by embracing dual heritage and cultures. She does this by reconstructing the black identity within the western world by adding personal prints, embellishments and personal old polaroid photos of her family. Her work is a fusion of generational experiences, with some pieces being inspired from extracts from her Father's diary. The brand ethos is all about identity.